I escaped yesterday to my local quilt store and found this frog-tastic new quilt. I just had to put together one block last night, it was to cute to wait. The design shows 3 frogs made out of each fabric, but there are two many different batiks that would look great as a frog so I will be making all of my frogs out of different fabrics. Also the design says to paint the eyes on with fabric paint, but I am thinking I will try and find some cute tortoiseshell buttons for the eyes. Anyways very excited to have yet another new project in the works. I am still working frantically now to finish "special delivery" as my goal was to have it done by the end of June. 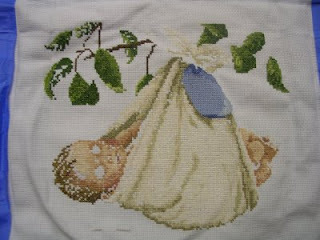 Did I mention I had also picked up 3 new cross stitch charts. I need to wear a sign around my neck that says please don't sell me any new charts when I go into my local needlework shops. Yeah!! Almost done with "special delivery". I only have the backstitching and a few feathers to add in. And of course the babys eyes to stitch in, I am going to do them the actual color of the babys eyes even though the chart calls for brown. Also on my own project "Faith" I am close to a finish. I just have to do the white outline, a few more words and little flowers on the stem and I am finished. I made myself promise I would not go back to the cross-stitch shop until I finished some of the many wip's I have at home. 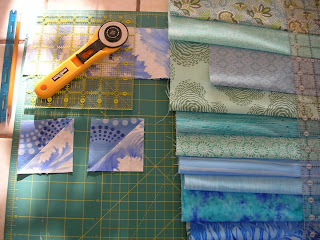 After these two I am going to try and finish my "spring rose" quilt top. I want to have that one professionally quilted (#1 I want to try a fancier pattern for the top, #2 I dont want to machine stitch it and #3 I definately dont want to hand stitch it). 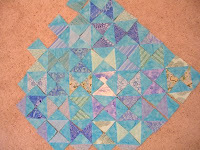 But I have never used a professional quilter to finish my work, so I am sure it will be an interesting challenge finding someone and then turning over a project to them that I have put so much of my work and love into. Special Delivery is still coming along as slowly as ever. I hope and plan to have it done by the end of June. I have been feeling yuck for most of this week, so have only worked on it twice. I have also stopped working on any of my many other projects. I just want to get this one done!! So I spent four hours yesterday cutting and sewing pieces for the mermaid quilt, I was very motivated and had gotten myself a new rotary blade so it was much easier. But then last night when I laid them out on the floor they just weren't right. There were just too many colors, and while the original had a cool 70's vibe going mine just looks more like Florida retirement home tropical (the bright turquoise and greens did it). So I think I am going to only use one of the batik prints against the turquoise tie dye fabric and then do the mermaid in a dark navy with variegated thread outline and maybe some beads thrown in. I just have to find the motivation for another day of cutting out little tiny pieces. I'm not a detail/precision person more of a a throw it all together and see what happens, so rotary cutting kills me. Anyway I think I will have to set it aside for a moment and try and finish special delivery, I am so close and just want to have it done. Hopefully the next post of "Special Delivery" all I will have left to do is the outlining. So this is what an hour of my day looks like. See those two tiny blue squares on the left side. Yes it took me an hour to do just those two. In my defense I did iron all the other fabrics you see in the pic, and I also had one hitting/biting toddler with a tattletale for an older sister to deal with. 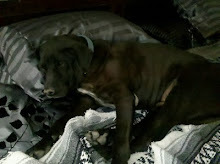 But still I must admit I am a much better cross-stitcher than a quilter. Yes I started ANOTHER project, I don't even want to think about how many I have going right now, they will never all be done!! This one was inspired by someone else's blog and I saw the piece and just had to make one of my own. 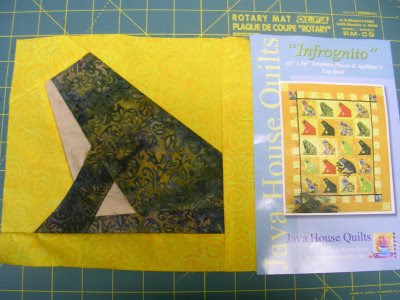 I was reading QuiltDads blog (yes a man who is crafty!) and he was part of a quilt exchange and received a beautiful doll quilt with all these awesome oceany blues and greens and a mermaid! I couldn't resist the mermaid. 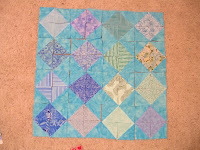 And also in some dim part of my brain I thought hmm a doll quilt that shouldn't take too long.....I am on hour one and have only two measly squares to show for it. Part of why it took so long today is that today is my "zombie" day. I work night shift so on my weekends I switch back to sleeping at night by just staying awake for almost 24 hours on my last day at work. Its not pretty. Think jammies with really bad hair. I really needed to replace the blade on my rotary cutter today (would have made this all go much quicker) but couldn't muster the energy to shower and dress so a trip to the store was out of the question. Hopefully by tomorrow I will be switched around to daylight hours and can venture out into public again.